Multiple Sega branches tweeted an image of a lightbulb and a January 16 date today. This being the internet, all our favourite social media channels were quickly filled with rampant speculation about everything from Shenmue remasters to Yakuza PC ports to the impending reveal of the Dreamcast 2. Any of those are still possible (though don’t hold your breath, friends), but we do know at least one thing that will certainly be announced on that date. 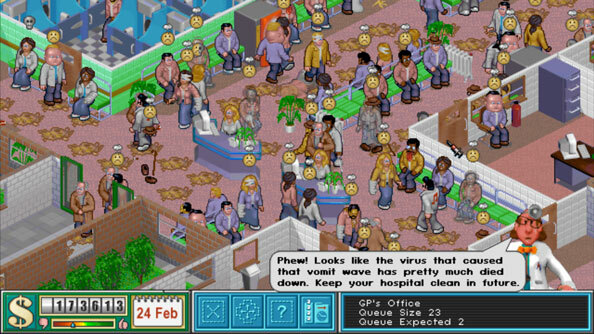 Find out how the original morbidly goofy management sim came to life in this interview with the makers of Theme Hospital. Two Point Studios – made up of former Lionhead and Bullfrog developers – said way back in November that they’d be revealing their new game on January 16. Today, they retweeted Sega’s January 16 lightbulb. The math is pretty easy from there. This will be the first game from Two Point Studios, and job listings from last year suggest that it will be some sort of successor to Theme Park and Theme Hospital in the form of a “fun, deep and elegantly crafted business management sim.” The sleuthy folks on ResetEra have dug up a computer software trademark for a Two Point Hospital from the studio. Two Point’s game – likely a new take on Theme Hospital – is all but certain here, but it’s definitely possible that Sega will be making further announcements this Tuesday, perhaps Nintendo Direct-style. Particularly given the stated plans and grandiose visions to expand their reach.